Download a vector file you can send to the flagmaker of your choice. The suggested colors from the Pantone Matching System are: PMS 2755, 186 and 123. I don’t necessarily endorse all of the views expressed in these books but they do an excellent job of explaining the background and rationale for the views presented here. A flag is a visual symbol we devise to represent something greater than ourselves - something to which we belong that we desire to be virtuous and eternal. Many look to their nation to fulfill that role, and display a national flag to signify their allegiance to the nation’s priorities. But Christians should recognize that such an allegiance is conditional, like any number of other allegiances we have in our lives, but for which we fly no flags. Our only unconditional allegiance is to God, but until now there’s been no flag to represent a Higher Authority than the nation. What about the Christian flag? When I first began to perceive the need for a flag that represents the kingdom of God I naturally turned to the Christian flag. But I soon noticed that it is usually displayed with the national flag and is always subservient to it. “Shouldn’t it be the other way around?” I thought. When I would see the two of them in a sanctuary I couldn’t help but think of the Ark of the Covenant and Dagon in the Philistine city of Ashdod (1 Sam 5). This arrangement struck me as blasphemous idolatry, and I think that if Jesus were to cleanse our temples today he would cleanse them of the national flag. Eventually I realized that I was taking the Christian flag too seriously - that apparently it’s purpose is to allay any guilt that might arise from having only the national flag present. The Christian flag was derived from the US flag. The red stripes were removed and the stars were replaced by a red cross. Its resemblance to the US flag has limited its international acceptance and relegated it to a subservient status when displayed with a national flag. 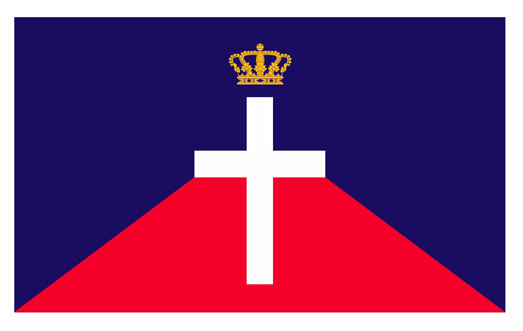 Whatever the original intent of the Christian flag, it is now essentially a sign that says: “We are Christians” or the redundant “This is a Christian church.” As such, it is merely an impotent conveyer of information rather than a symbol representing our King and His Kingdom. Flown beneath the national flag the meaning is clear, “We are Christians who owe our allegiance to this particular kingdom of the world.” Of course, this is a subversion of our proper allegiance but rather than trying to change the world’s perception and use of the Christian flag it made more sense to abandon it and create a new flag with a different purpose: symbol of the physical presence of the Kingdom in the midst of the world (Matt 11:12). Its solitary display before a church would identify that church as an embassy of the Kingdom. Embassies don’t fly the flag of their host country. So what, exactly, does this flag represent? When we submit to our Lord and become his disciples we become citizens of the kingdom of God. Whatever nation we once considered home, we now recognize that heaven is our home (we could, perhaps, be called Heavenites). National interests are replaced by kingdom interests. Then a teacher of the law came to him and said, “Teacher, I will follow you wherever you go.” Jesus replied, “Foxes have holes and birds of the air have nests, but the Son of Man has no place to lay his head.” (Matt 8:19-20) Jesus had no home here, nor will those who follow him. Think of yourself as a missionary in a foreign land. And if you reflect on the fact that your existence will continue beyond trillions of millennia, the importance of a transitory kingdom of the world diminishes significantly. “Blessed is the nation whose God is the Lord, the people he chose for his inheritance.” (Psalm 33:12) The “one nation under God” is the kingdom of God, and it is In God We Trust, not the weapons of the world (2 Cor 10:3-4). The kingdom inaugurated by Jesus imparts and manifests God’s will (Mat 21:43); its citizens are the light of the world – the city on a hill. No kingdom of the world can usurp that role or be assumed to be aligned with the will of God, and pledging one’s allegiance to a kingdom of the world creates a conflict of interest equivalent to serving both God and mammon. Why would Christians want to pledge their brotherhood to atheists and pagans of their own nation while ignoring their brothers and sisters in Christ living in other nations? We are called to pray for our leaders, but why do Christians ask God to bless up to our national borders and no further? * The map of the kingdom of God knows no national boundaries; its citizens could be called Christians Without Borders. What attracts us so to our national flag? It’s not about God. If Christianity here died out completely, the flag would remain the same. No, it’s all about us and our collective ego (the US flag, for example, has traditionally been called "Old Glory"). It is a reflection of our basic human drive for status, the assertion of our superiority and ultimately, the sin of pride. Think of the nation as one big sports team. Like all teams we support, we want it to win to demonstrate our collective superiority (to the other nations of the world) and, by extension, our superiority as individuals on this winning team. We lust for glory that belongs to God, a trait we share with Satan. God said: “I will not give my glory to another or my praise to idols.” (Isaiah 42:8). Paul said: “Do nothing out of selfish ambition or vain conceit, but in humility consider others better than yourselves.” (Phil 2:3). So much for sports. Christians should not be motivated by personal or collective glory - they should be motivated by love. In addition to expressing our pride in ourselves the national flag provides a means of expressing our gratitude for the freedoms and prosperity we enjoy. But Christians should ask themselves, “To what or whom, exactly, does my gratitude belong? Who is the source of my security, the focus of my identity?” They should consider the possibility that, as an expression of collective self-worship, patriotism is idolatry. If so, it is a parasite in the Body of Christ. Because it is our highest cultural value, inculcated in us from birth, many Christians seem to believe that asking them to give up patriotism is like asking them to give up their children to Molech, but the demise of patriotism is inevitable with the Second Coming of Christ. It is no more a virtue now than it will be then. Such national narcissism dilutes our allegiance to the kingdom of God and blinds us to the reality that our country has an agenda that diverges from the teachings of Christ. It lulls us into a false security that we can trust in something other than God - something we can see - yet have His stamp of approval on it. We are not called to love a country or endorse its actions but we are called to love God, our neighbors and our enemies (Mark 12:30-31, Luke 6:27-28). We exist to love, and to glorify God. That is sufficient. Patriotism is the world’s counterfeit for this higher calling, one that suggests: “Love your neighbor [if he lives on this side of the border] and hate your enemy” (Matt 5:43-44). This deception has corrupted the Church for 1700 years, justifying non-Christian behavior by Christians to support the State. It’s time to repudiate it and trust in the Lord rather than "chariots and horses" (Psalm 20:7). Lastly, the national flag is a subtle reminder of the expectation that we will rally to any calls to kill our enemies when we feel threatened. Thus, it is like a security blanket to many, but for Christians it should not be so. “God and Country” are two masters. We are to proclaim the worldwide kingdom of God. This proposal to symbolize it is intended to direct all glory and allegiance to our King as we embrace a life of humility. My question to patriotic Christians is this: What would the kingdom of the world in which you dwell have to do to get you to stop displaying its flag--how immoral would it have to become? You can fly a flag for a god or fly a flag for God. Choose for yourselves this day whom you will serve. . .as for me and my house, we will serve the Lord. The purpose of the Kingdom of God flag is to replace national flags flown by Christians. It is best flown alone; but if displayed with other flags, it shall occupy the supranational position as illustrated. It has no pledge of allegiance and is not to be idolized. There is no requirement to adopt the worldview expressed on this website; it's His flag, not mine. All citizens of the Kingdom are welcome to become standard bearers with it and publicly acknowledge Christ's sovereignty over their lives (Matthew 10:32). It is also appropriate for display on the coffins of those who have served the Kingdom. I am not a flag dealer. Anyone can make these and sell them without my permission -- the design can be downloaded from the sidebar above. customproducts@onlinestores.com has the design, but ordering only one would be expensive due to setup costs. Brad Nelson at nelsonpress.com offers polyester flags sized 2x3 at $52, 3x5 at $77, and 4x6 at $110, plus shipping. Quantity discounts are available. *I would like to suggest that Christians, in a spirit of self-sacrificial love, should forego their usual prayer for the blessing of the country in which they live (and, therefore, themselves) and instead confer it upon the people of North Korea to free them from the most onerous political oppression in the world (greater than that experienced by the Iraqis under Saddam Hussein). **By June Alliman Yoder and J. Nelson Kraybill.